Students will also be taught how to improve these components. 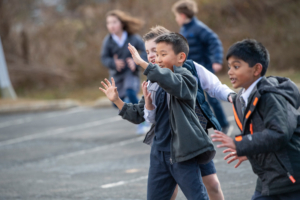 Motivating students to participate in physical activities in and out of the classroom is an integral part of the physical education program at Providence Academy. Students in 6th-8th grade will have health education as well as physical education. The health curriculum focuses on the three aspects of health: physical, mental, and emotional. Students will be provided with an understanding of the human body and how to properly care for it. Students will be taught about nutrition, stress management, and healthy life choices. Biblical principals are integrated in the curriculum in order to show how the Bible addresses issues related to health and well-being.